Snow, Freezing Rain Move East To Put A Chill On The Weekend : The Two-Way "A major icing event is forecast through Friday across portions of the southern Great Plains toward the Lower Ohio Valley," the National Weather Service says. Some are saying an ice storm Friday and Saturday will be the nation's worst since 2009. Snow and ice will hit a broad area from Texas to the Ohio Valley on Friday and Saturday, the National Weather Service says. This composite satellite image was taken at 6:15 a.m. ET Friday. Wind-whipped freezing rain were moving through large parts of the nation on Friday, with the major winter storm blamed for a traffic death in Dallas and the deaths of four people from hypothermia in California. The Associated Press says "more than a thousand flights have been canceled, football and basketball games postponed and holiday celebrations including town tree lightings and parades curtailed." A band of snow and sleet stretched from as far south as New Mexico, Texas, Oklahoma and Arkansas and extended through Kentucky, Ohio and Indiana, where there were 10 inches of snow in some places. Crews in Oklahoma, Arkansas, Tennessee were being kept busy clearing roads of dangerous ice. "Friday night, snow will taper off in the Ohio Valley, and quickly sweep through the interior Northeast and New England. Precipitation may be in the form of snow, sleet, or freezing rain in Boston and Hartford overnight, with generally light ice or snow accumulations expected." "The weather forced the cancellation of Sunday's Dallas Marathon, which was expected to draw 25,000 runners, some of whom had trained for months. A quarter of a million customers in North Texas were left without power, and many businesses told employees to stay home to avoid the slick roads." "This will be the worst ice storm for the United States since January 2009 and will affect many of the same areas as that storm," says AccuWeather's Jesse Ferrell. "A strong cold front extending from the Mid Atlantic coast to the Central Gulf Coast will slowly push southeastward over the next two days before returning as a warm front at the end of the period." "A band of heavy snowfall will set up across portions of the Mid Mississippi Valley and Ohio Valley this afternoon with up to 10 inches of snow possible. 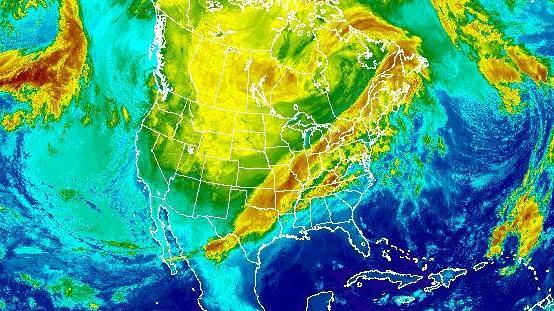 A shallow layer of cold air in place across the Tennessee and Ohio Valleys is being overrun by milder air aloft leading to a prolonged period of freezing rain in the region." In northern portions of the West Coast — and a wider area extending to the central Rockies — the weather service says people should get ready for more rain and snow on Saturday. In Denver, temperatures aren't expected to rise above the teens all weekend; there's a chance of snow on Saturday and Sunday, according to The Denver Post. It'll be even colder north and west of Denver, where lows could reach 50 degrees below zero in parts of Montana, Idaho, Wyoming and the Dakotas. "Additionally, snow will move into parts of the Great Basin/Southwest and the Northern/Central Rockies on Saturday," the weather agency says. "Snow will also develop over parts of the Central Plains by Saturday evening." In California, farmers have put in long hours this week trying to save part of the state's $2 billion citrus crop, in addition to lettuce and avocados. They're harvesting during the day and nursing their plants at night, using water and fans to keep them from falling prey to dangerously low temperatures. "We need the cold air to color up the fruit and bring up the flavor," Bob Blakely, director of industry relations for California Citrus Mutual, an association of growers, tells the AP. "It's our greatest blessing, but if it gets too cold, it can be a curse." Parts of Southern California are expected to get a break from the cold this weekend.